St. Louis, Mo., 10¢ black on greenish, vertical strip of three, types I-II-III, positions 2/4/6, uncancelled, mostly large margins except touched at lower right, on blue 1846 Charnley & Whelen folded letter to Philadelphia Pa. paying triple the 10¢ letter rate per ½ oz. for over 300 miles, red "St. Louis Mo. Mar 3" cds and matching "Paid" handstamp with manuscript manuscript "30" cent rating at upper right; bottom stamp with pressed file crease, middle stamp with minute closed tear in left margin, Very Fine appearance, ex-Lilly, Faiman; with 1981 P.F. certificate. Scott No. 11X2 Estimate $75,000 - 100,000. ONE OF ONLY TWO COVERS BEARING A STRIP OF THREE OF THE 10¢ ON GREENISH, THIS BEING ONLY RECORDED UNCANCELLED STRIP OF THREE ON OR OFF-COVER. 1. Off cover, ex- Faiman (lot 41). 2. 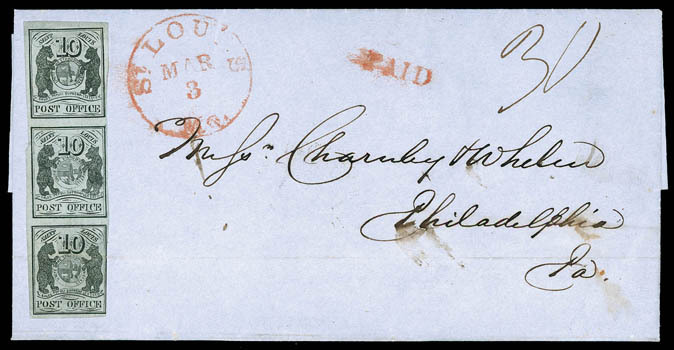 Uncancelled on Charney & Whelen folded letter to Philadelphia Pa., ex-Lilly, Faiman, the cover offered here. 3. Cancelled by red St. Louis cds on Charney & Whelen folded letter to Philadelphia Pa., ex-Emerson, Caspary. The unique strip offered here is the only uncancelled strip of three of any denomination, and the largest known uncancelled multiple of the St. Louis Bear issue. Revenue, 1863, First Issue, 3¢ Playing Cards, imperf, unused (no gum), large margins including huge left margin, intense shade with a proof-like impression, Extremely Fine and choice, ex-Cunliffe; with 2008 P.F. certificate. ONE OF ONLY TWO RECORDED UNUSED EXAMPLES OF THE 3¢ IMPERFORATE PLAYING CARDS ISSUE. 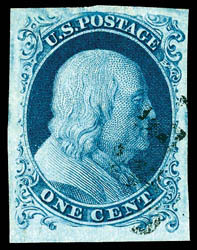 ONE OF THE RAREST FIRST ISSUE REVENUE STAMPS IN ANY CONDITION, NEVER MIND IN SOUND CHOICE CONDITION WITH FOUR MARGINS. We note only two unused examples of the 3¢ Playing Card imperforate issue, the example offered here and one offered in the Wildhorse collection. The fact that this stamp possesses four margins and is sound makes it remarkable. 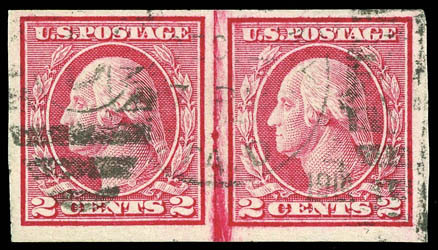 1914, 2¢ carmine, imperf coil, horizontal line pair, two strikes of light December 1914 duplex cancels, attractively centered, bold bright color, light crease in lower portion of right margin which does not affect the design, Very Fine, ex-N. Grace; with 1981 and 2009 P.F. certificates. THE UNIQUE USED LINE PAIR OF 1914 2¢ IMPERF VERTICAL COIL - THE EARLIEST KNOWN USAGE OF THE FIRST ROTARY COIL TO BE ISSUED - A PHENOMENAL U.S. PHILATELIC RARITY. The 1914, 2¢ carmine, imperf coil was issued on June 30th of 1914 with 21,000 coils being ordered by the U.S. Automatic Vending Machine Company. This order consisted of 14 rolls of 1,000 and 14 rolls of 500. Since no notice was given that this order was filled with the new rotary press stamps, its existence went completely unnoticed at the time of issuance. It wasn't until 1917 that two of these rolls (one 1,000 roll and one 500 roll) where noted by stamp dealer Philip Ward Jr. and is the source for virtually all the unused examples in the market today. 1851, 1¢ blue, type Ia, position 99R4, very light town cancel, large well balanced margins all around, exquisite sharp detailed impression enhanced by bright rich Plate 4 color, Superb, this is one of two known examples to receive this lofty grade with none higher, ex-Neinken; with 2010 P.S.E. 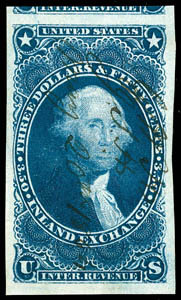 Graded certificate (Superb 98, SMQ $96,000). 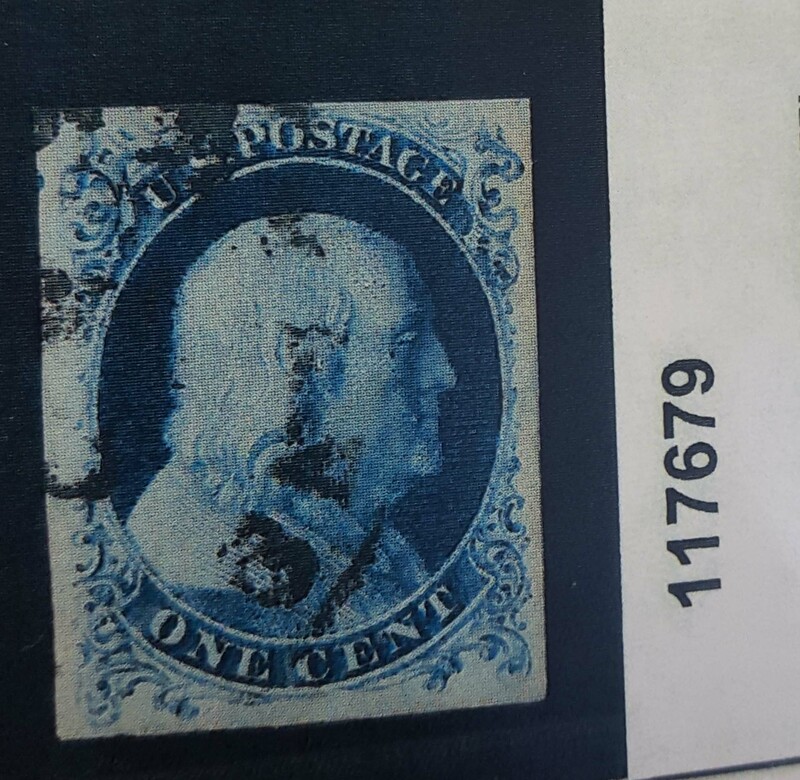 A STUNNING LARGE MARGIN SINGLE AND CONSIDERED TO BE THE FINEST USED EXAMPLE OF THE 1851 1¢ TYPE IA IMPERFORATE. Produced only from 18 of the 20 subjects in the bottom row of both panes of Plate 4, the 1¢ imperforate, type Ia owes it's rarity to the short three month period that the Plate 4 imperforates where produced. 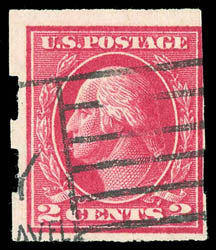 One other example has been graded by the P.S.E., however this example has shorter margins at top and bottom and bears a much heavier town cancellation (Click here for the comparable graded stamp). 1920, 2¢ deep rose, type Ia, imperf, neat slogan machine cancel, margins large showing the Schermack type III perfs at left to just shaving design at upper right, intense deep rose color on bright paper, Fine and attractive, one of the very few bearing a slogan machine cancellation; with 1963 and 2001 P.F. certificates. 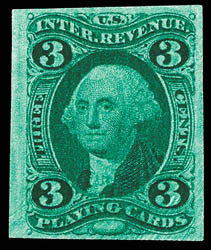 A HANDSOME AND DESIRABLE SOUND EXAMPLE OF THE 1920 2¢ TYPE IA IMPERFORATE WITH SCHERMACK TYPE III PRIVATE PERFORATIONS. Of the approximately 45 examples known, only one example is known mint, only one used pair is recorded. Many of the known singles have margins cutting well into the design. Revenue, 1863, First Issue, $3.50 Inland Exchange, imperf, neat 1864 manuscript cancel, large to huge margins showing portion of adjacent stamp at top, deep intense color on bright paper, Extremely Fine to Superb, a truly magnificent example of this rare revenue issue; with 2015 P.S.E. Graded certificate (XF-Sup 95). 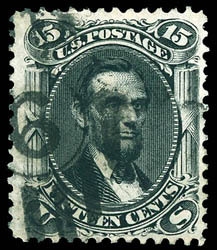 CONSIDERED TO BE THE FINEST KNOWN EXAMPLE OF THE 1863 $3.50 INLAND EXCHANGE IMPERFORATE ISSUE. 1861-66 (1875 Re-issue), 15¢ black, bold duplex cancel, deep intense black shade, attractively centered within wide margins, Very Fine; with 2001 & 2014 P.F. and 2000 P.S.E. certificates. ONE OF THE FINEST USED EXAMPLES OF THE VERY RARE 1861 15¢ RE-ISSUE IN SOUND CONDITION. According to the Siegel census, only fifteen examples of the 1861 15¢ Re-issue are recorded, with only six examples known to be certified in sound condition. Envelope, 1920, 2¢ on 2¢ carmine on amber, mint entire, size 10, knife 59, watermark 19, rich color on fresh paper, Very Fine, ex-Whitington, "Wanamaker"; with 2002 P.F. certificate. UPSS No. 2943A $30,000. 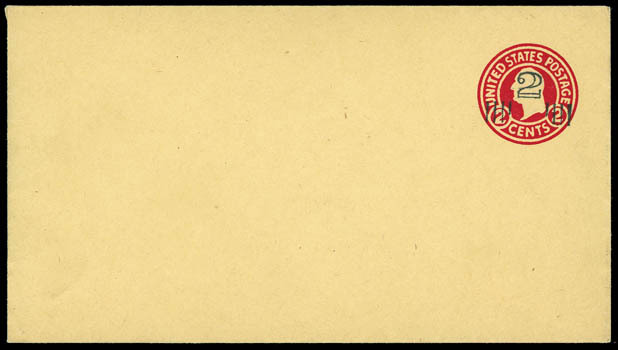 A CHOICE EXAMPLE OF THIS RARE ENTIRE, BEING ONE OF THE KEYS TO COMPLETE 20TH CENTURY STATIONERY COLLECTIONS. There are only 5 recorded examples of this entire. 1901, 4¢ Pan-American, center inverted, overprinted "Specimen", bottom margin plate "1145" number single with siderographer's initials below, full o.g., tiny hinge slivers sensibly reinforcing perfs, clear strike of "Specimen" handstamp neatly applied in margin at left, fresh with rich color, Fine and attractive, ex-Colonel Green, Cunliffe; with 1996 P.F. and 2009 P.S.E. certificates. 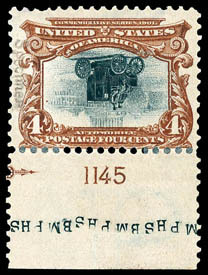 THE UNIQUE PLATE NUMBER SINGLE OF THE 1901 4¢ PAN-AMERICAN INVERTED WITH SPECIMEN OVERPRINT. Only four examples of the 4¢ Pan-Am Invert with plate numbers are recorded, this being the only example bearing the extremely rare Specimen overprint. Only 13 examples of this specimen have been expertized by the P.F. and is without question far rarer than its non-specimen counterpart. 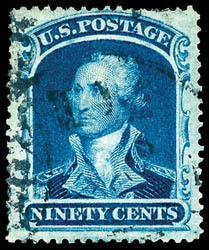 1860, 90¢ blue, very well centered amid wide margins, deep color, light town cancel, fresh and Extremely Fine; with 1977, 1991 and 2011 P.F. certificates. AN EXTRAORDINARY USED SINGLE - UNQUESTIONABLY AMONG THE FINEST OF THE FEW WELL CENTERED EXAMPLES THAT ARE ALSO COMPLETELY SOUND.